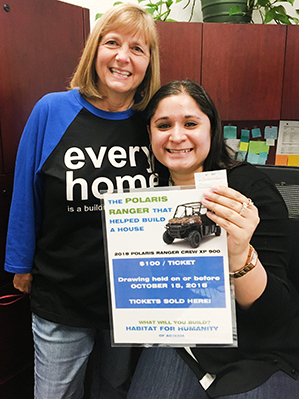 Teresa Ashley, left, Habitat for Humanity of Artesia board president, presents Victoria Carrillo with her winning ticket after it was drawn in HFH’s raffle of a 2019 Polaris Ranger. HFH would like to thank everyone who purchased a ticket and Bennie’s Western Wear, Artesia Credit Union, The Jahva House and Hopscotch Brewing for the support received. Proceeds from the raffle will be used for building materials on HFH’s next home, to be located on West Grand Avenue, and will help give a “hand up” to a local family. HFH continues to seek financial donations and volunteer assistance. For more information, contact Kathy Phipps at 746-6365 or mail donations to: HFH of Artesia, P.O. Box 686, Artesia, N.M., 88211-0686.